Marvel at the scenery of Badlands National Park (www.nps.gov/badl), 98,785 hectares (244,000 acres) of striking rock formations including steep canyons, jagged spires, bands of colourful rocks and mixed-grass prairies. Camping grounds and cabins are available to visitors. Discover the natural beauty of the Black Hills and Wind Cave National Park, then see the annual Buffalo Roundup in Custer State Park (www.sdgfp.info), when cowboys bring in a thundering herd of 1,500 bison. Visit the Crazy Horse Memorial (www.crazyhorse.org) in the Black Hills, the largest mountain carving in the world. It has been a work in progress since 1948, and is a memorial to the spirit of Lakota chief Crazy Horse. Discover the real Wild West across the Missouri River in Fort Pierre (www.fortpierre.com), South Dakota's capital. Follow the trail of explorers Lewis and Clark, see rodeo riders in action, visit the South Dakota Cultural Heritage Center or go hunting and fishing. Dip in the waters of Evans Plunge Indoor Water Park, soaking in the hot springs once jealously guarded by Indians of the Black Hills. Explore Jewel Cave National Monument near Custer, the second-longest cave in the world with 226km (141 miles) of tunnels. Lantern tours are offered in summer (www.nps.gov/jeca). 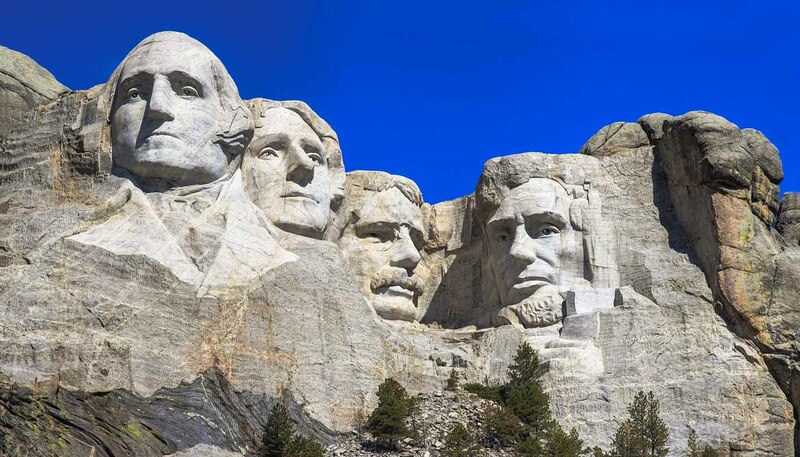 Gaze up in awe at four former presidents carved into the face of Mount Rushmore. Work began on this massive 'Shrine of Democracy' in 1927 and took 14 years to complete (website: www.nps.gov/moru). Visit Sioux Falls (website: www.siouxfalls.com) and see the same waterfalls that drew buffalo hunters and early fur traders. Catch up on history at various museums and historical sites, including the Center for Western Studies, the Old Courthouse Museum, St Joseph's Cathedral and the Washington Pavilion of Arts and Science. Visit the Mammoth Site (www.mammothsite.com), and tour an active dig to see bones and fossils of Woolly Mammoths and other Ice Age creatures. Dip in the waters of Evans Plunge Indoor Water Park, soaking in the hot springs once jealously guarded by Indians of the Black Hills. Visit the Mammoth Site (www.mammothsite.com), and tour an active dig to see bones and fossils of Woolly Mammoths and other Ice Age creatures.